Visiting US Deputy Defence Secretary Paul Wolfowitz has escaped unhurt after a rocket attack on his hotel in Baghdad. Up to eight rockets were fired at the Hotel al-Rashid, one of the most heavily guarded sites in the Iraqi capital. A US colonel working for the Coalition Provisional Authority was killed and 15 other people, including 11 Americans and one Briton, were wounded. But US officials say they believe that Mr Wolfowitz was not a target of the attack, which they suspect was in preparation for "a couple of months". The attack came on the day an overnight curfew, which has been in force since the arrival of US-led troops in the city, is being lifted for the start of Ramadan. A BBC News Online correspondent in Baghdad says that many people there believe anti-American attacks may increase with the ending of the curfew. On Saturday, the US State Department had issued a specific warning of a plan by Islamic extremists to attack a hotel in the capital, without giving specific details. Mr Wolfowitz is due to complete a three-day visit to Iraq on Sunday night. He said that danger persisted in Baghdad "as long as there are criminals out there staging hit and run attacks". "This terrorist act will not deter us from completing our mission," he said. "There are a few who refuse to accept the reality of a new and free Iraq. We will be unrelenting in pursuing them. As the president has said, we are taking this fight to the enemy." The attackers appear to have driven a van into a nearby park where they dropped off a trailer containing a rocket launcher, disguised as a generator, about 400 metres (1,312 feet) from the hotel. They then set off a timing device and fled, leaving the rockets to launch at the hotel a few minutes later. An Iraqi security guard told the Associated Press he saw projectiles flying towards the hotel. "There was a whooshing sound," said Dafer Jawad. "One landed in the front of the hotel. I saw very heavy white smoke in front of the hotel." A fire started and about 200 people, including US officials, contractors and journalists gathered in the lobby of the hotel before leaving the building - some still in their pyjamas. 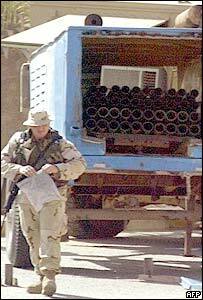 US forces later recovered a number of rockets from the trailer. US military and civilian employees use the hotel, which was targeted a month ago in a rocket-propelled grenade attack which did little damage. On 19 August a car bomb attack on the UN headquarters in Baghdad killed 22 people, including the UN special envoy Sergio Vieira de Mello. At 0400 (0100GMT) on Sunday the overnight curfew which has been in force since the fall of Saddam Hussein ended for the last time. As well as lifting the curfew, the US military has reopened a key bridge across the Tigris river. The military said that improved security in the capital had made it possible to take these measures. Mr Wolfowitz has been making his second visit to Baghdad in three months to discuss security and reconstruction. 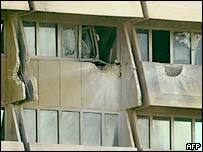 He was staying with senior aides on the 12th floor of the al-Rashid, well above the area hit by the rockets. At the time of the attack, his party was preparing for a breakfast meeting on the electricity supply in the city. Earlier in his visit Mr Wolfowitz had stressed the need for increased efforts to develop a new Iraqi army and police force. Speaking on arrival in Baghdad on Friday, he said Iraqis increasingly were "putting their lives on the line to defend their country and build a free and prosperous future". "This must have seemed like the safest place to house Wolfowitz"